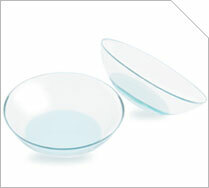 Clear View Eye Clinic is proud to carry and fit Synergeyes contact lenses. These lense offer the superior clarity of hard contact lenses with the comfort of soft contact lenses. The design is simple yet revolutionary: take a hard contact lens (or RGP) and surround it with a soft contact lens "skirt". This design prevents eyes from feeling the edge of hard lenses, especially when blinking. Synergeyes brand contact lenses are ideal for: astigmatic patients who experience inadequate or fluctuating vision in their current contact lenses, patients with higher prescriptions who dislike the comfort of RGP lenses, keratoconic patients who would like a more comfortable option of correction, and post-corneal surgery patients. Now available in a multifocal design!